Numbers 28 and 28A Castle Street in Thornbury are now two separate houses. In the photograph on the left number 28 has a yellow door and number 28A the taller of the two properties has the black door. The histories of the two houses are closely connected and at various times they have both been owned by the same families. The earliest records of these buildings were found in the Gloucester Record Office. These include a schedule that traces the earliest known transaction for the properties. The schedule indicates that there was a property on the site since at the least the mid-1700s. In fact, it appears from another piece of information that at that time there were probably two properties which later housed five separate households. In the nineteenth and twentieth centuries the successive owners of 28 also owned 28A. There is still no precise information as to how these properties were divided and the actual divisions could have changed at different periods. The only indication of the possible layout can be got by studying the 1840 Tithe Map. We have an extract from the Tithe Map here on the right. This seems to show that the house that is now 28 was number 277 in the Tithe Apportionment and that divided into two on its street frontage. The neighbouring property (now 28A) was given the Tithe number 278. It appears to have three buildings built onto the back of it which are hatched to show that they were inhabited. These buildings would have been like a court at the back of the houses fronting Castle Street. The court might have been accessed through the passageway which presently exists which was previously covered by a double wooden doors. This entrance is unfortunately just behind the car in the large photograph on the left but is clearly shown in the photograph below on the left. It is also possible that the entrance to the court could have been via the doorway that was once on the far left of 28A which in the modern photograph above has become a small window. We are not sure for how long this passageway existed or how big it was. Looking at similar arrangements elsewhere in Thornbury we believe that if there was an entrance to a “court” at the back it would have been quite a small narrow passage. This theory is supported by a photograph that was probably taken in the first quarter of the twentieth century, possibly around 1910. The photograph below on the left is a section of this photograph and it shows a small door and a window where there was later double wooden doors and later still an archway. Please note when looking at this photograph that the perspective is slightly distorted and the whole building looks narrower than it really is. The first part of the house has a long banner on it which says “Long live the King and Queen.” The second taller part of the house has a sign on which juts out into the street and which says E J Salmon. The grandson of Robert Mills who lived here and ran a business from these premises has confirmed that the property was at one time five separate cottages and says there was a baker’s shop there as well. Apparently there was also a partitioned outhouse that had a stall for a horse. A local history enthusiast, Mrs Riddiford, has said that she can recall a time when the entry on the south side of the building (shown above with double white doors) went into a small courtyard which had four buildings in it. Mrs Riddiford said that Eddington the printer owned one building, two others were residential and one was a butcher’s store which once had meat hooks in the ceiling. We have one photograph on the left which illustrates the buildings Mrs Riddiford can remember seeing. Click on the photograph for a larger image. 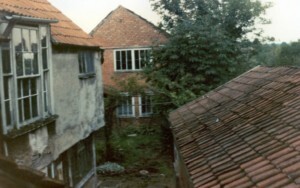 For many years the back of the house was used as a yard for the painting and decorating company owned by the Mills family which traded as Mills and Philips for much of its time (certainly from 1923 to 1973). The tall building at the back of the houses was said to be where the Mills family printed their own wallpaper designs. The Embletons themselves built a “decorative well” for watering the garden. The house is built on Thornbury rock and has no cellar. The catalogue describes four rooms with rear lobby and hall on the ground floor, five bedrooms and a bathroom on the first floor with a concealed staircase to a second floor and two more bedrooms plus an integral garage and a two storey workshop. The total building is so large that the Local Planning Authority indicated that they would welcome the property being converted into two or three town-houses and they suggested that the buildings at the rear could be demolished. We find that interesting as the house was also said to be in a Conservation Area.